A Great Blue Heron (Ardea herodias fannini) hunting in a small pond at Devonian Harbour Park, near Coal Harbour and Stanley Park in Vancouver, British Columbia, Canada. In mid March of this year I went to Stanley Park to photograph the cherry blossoms and a few other things. After I was finished photographing cherry blossoms I walked along the seawall to the Convention Center. 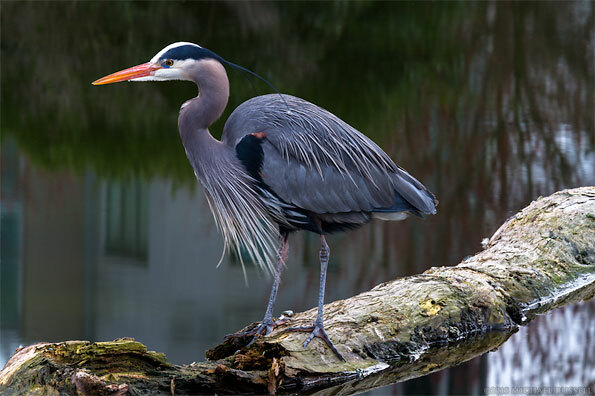 On the way, in Devonian Harbour Park (between Stanley Park and Coal Harbour) I saw this Great Blue Heron (Ardea herodias fannini) fishing in a small pond. 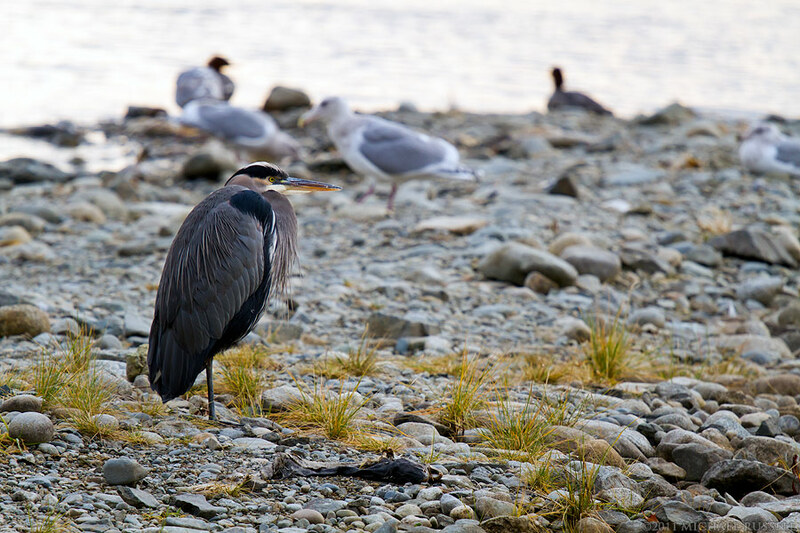 One of the largest urban colonies of Great Blue Herons reside at Stanley Park – so seeing herons here was not really a surprise. I made this photograph not only because I was already standing close to the Heron, but because of the reflection of the buildings in the background. 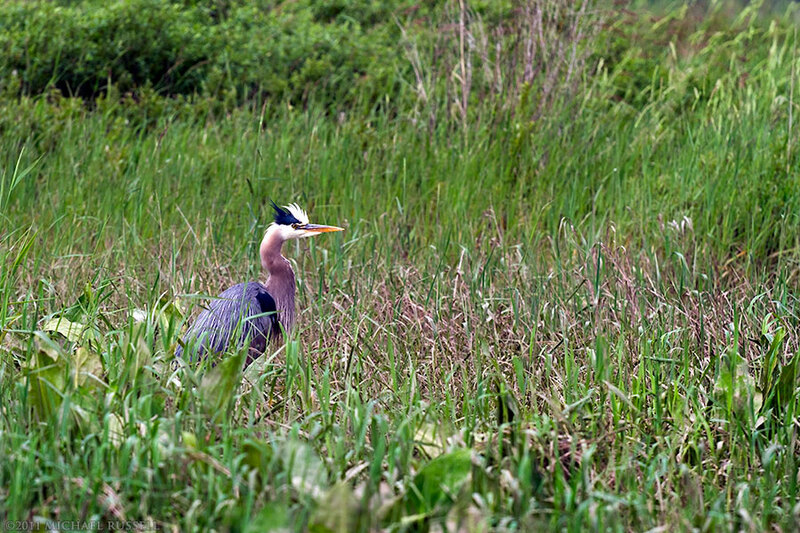 This pond is right next to the Stanley Park Causeway, which is a bit like a highway most of the day, and just beyond that are very expensive apartment buildings in the “West End” of Vancouver – so this is a wild animal in an urban environment. 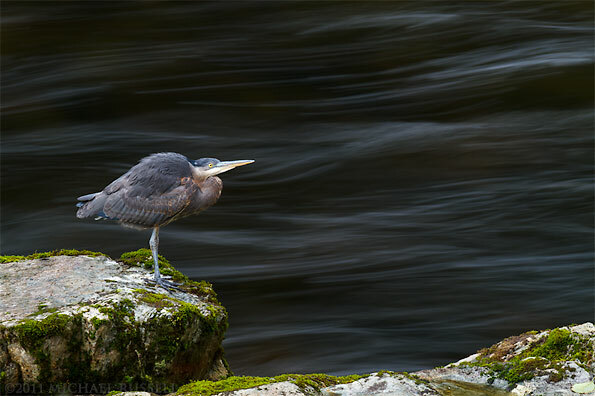 As is usual for Herons, this one made a good subject by standing still most of the time I was there. 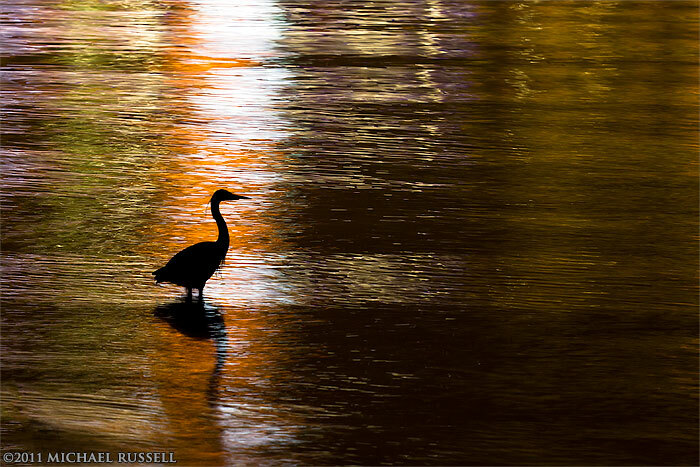 One of my favourite Heron photographs was just across the harbour in Stanley Park – a Heron fishing at night. 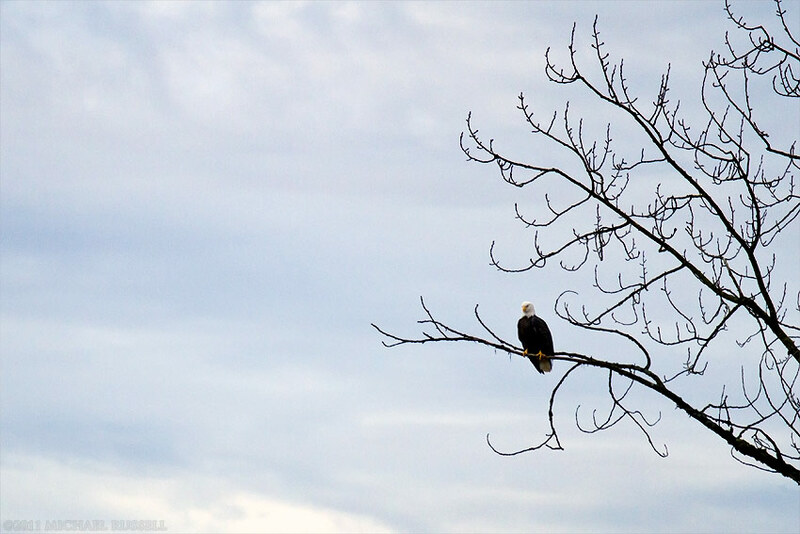 You can view more of my Bird Photography in my Bird Photography Gallery in my Image Library. 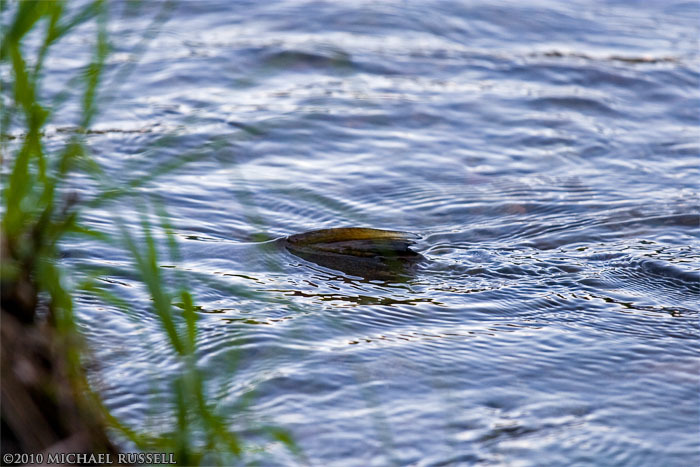 Late last year I published a post on this blog called “Creating Drama with Shutter Speed“. 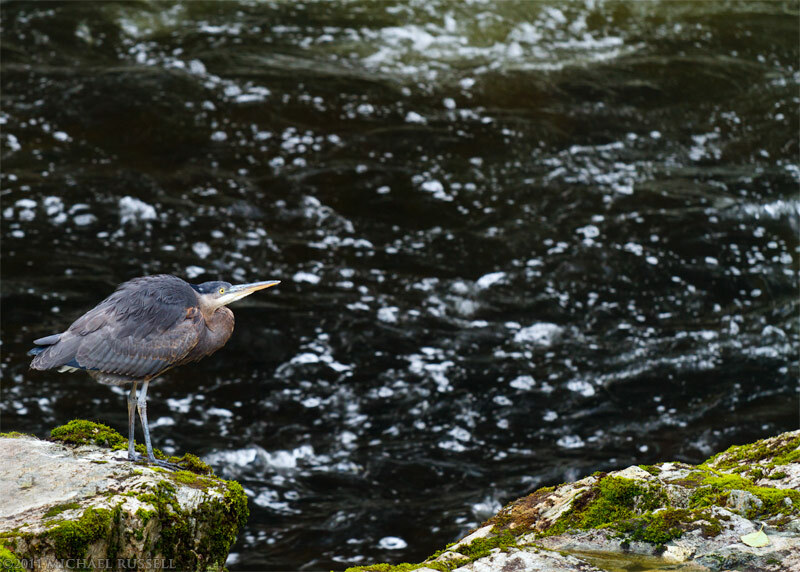 While at the Capilano River in North Vancouver, British Columbia I had made a few photographs of a Great Blue Heron (Ardea herodias). By utilizing different shutter speeds I found that (in this case) a shutter speed of 0.6 seconds brought a lot of drama to the scene by blurring the river in the background. This photo is another photo I made that day of the same Heron, again with a slower than normal shutter speed ( 1/6th of a second in this case). While I think my favourite of the day is the slow shutter speed Heron photo from that other post, this one comes in a close second for me. In October I visited the banks of the Capilano River in North Vancouver in search of some fall colours. I didn’t find much there, but the canyon is always so beautiful that I knew a photo opportunity would be likely regardless of the state of the leaf colours. 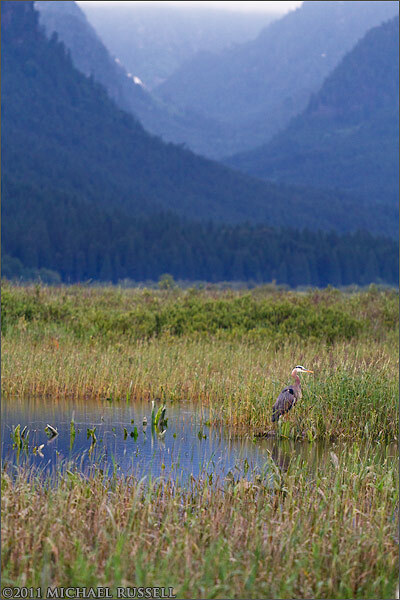 Lucky for me, this Great Blue Heron (Ardea herodias) was lounging near the bank and posed for some photographs. Often when I shoot wildlife with my 70-200mm f/4 L IS lens, I switch to AV mode and f/4 so that I am always getting the fastest shutter speed possible. I do not know what I am going to encounter a lot of the time, and this gives me a good chance of being able to catch whatever action I may happen upon. On this day I had upped the ISO to 640, so that I had a bit of extra shutter speed available (1/125 sec) for this photo. Thankfully the 7D does great with much higher ISOs than this – so there is some room available for dealing with low light. 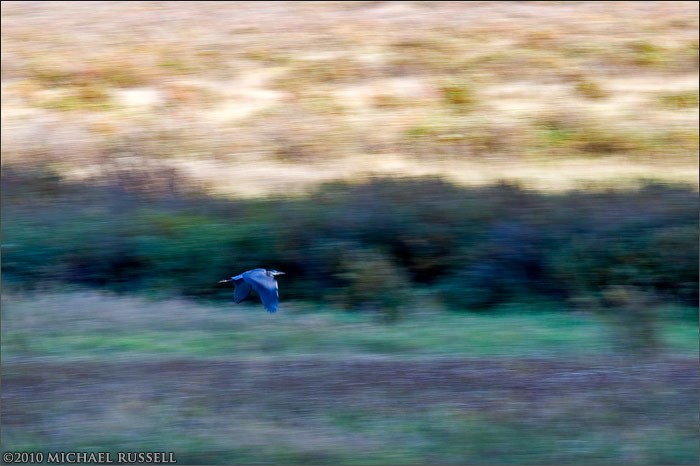 When I came upon this Heron, I was able to make this photo quite easily with these settings. While I like the above shot I thought there might be an opportunity to make a better photo. Having tried a number of ideas with a faster shutter speed, I decided to try a slower one to see what I could do with the water in the background. I changed my aperture to f/18, and lowered my ISO to 100 in order to create the longer shutter speed. 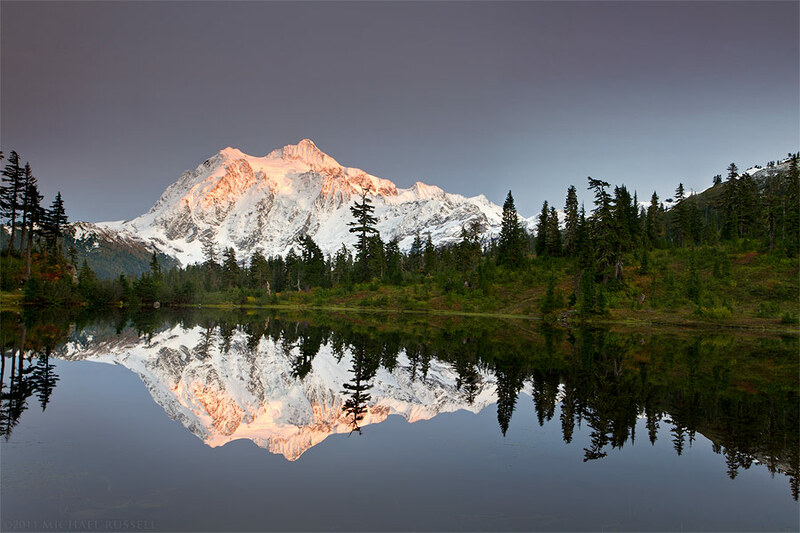 Using a tripod, I made the photograph on the left with a shutter speed of 0.6 seconds. I believe that the blur in the river created by the slower shutter speed makes the second photo here much more dramatic and interesting than the first. The Heron doesn’t really change between them, the rocks remain the same, but the longer shutter speed creates a great effect in the river. While I do this quite often with static landscape subjects, this is one of the first times I have tried this with a wildlife photo. 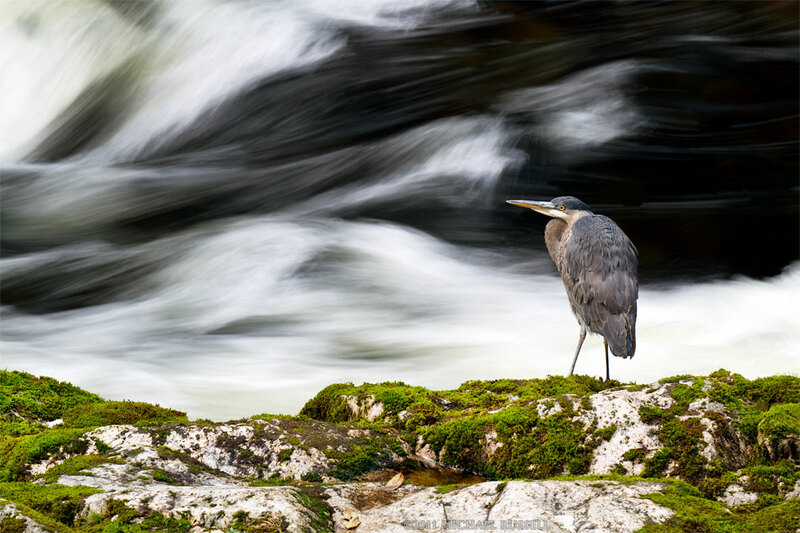 Granted, the Heron made a great subject for this attempt, but this really shows how varying shutter speed can have dramatic impact on the photographic result. 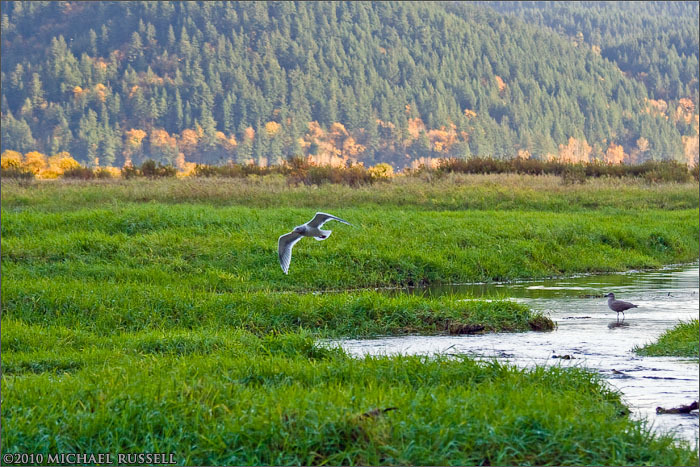 A few weeks ago I visited the Pitt-Addington Marsh Wildlife Management Area near Pitt Lake. 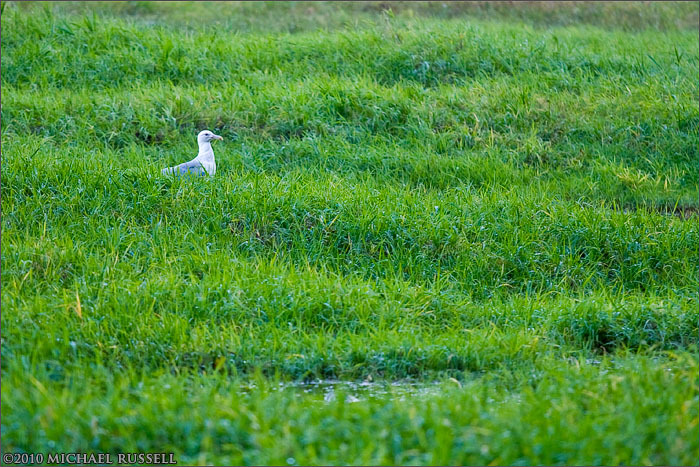 Shot a lot of landscapes, but this area is always a good place to spot a lot of birds and general wildlife. I walked along the dike for a while, then down into the marsh along a trail. What I should have done was look at the marsh before I came down off the dike into it – as there was a Great Blue Heron standing about 5 feet in front of me looking a bit startled. He took off immediately and landed at a distance just near enough for me to see him and just far enough away that my longest lens wasn’t quite going to cut it. I must not have looked like too much of a threat because once I got the wide angle lens back on and started shooting the landscape he flew close again. Not as close as our original encounter but close enough for me to be happy with the photographic opportunity. Was hoping for some hunting shots like I had at Stanley Park recently but today this one seemed much more intent on cleaning and preening itself.